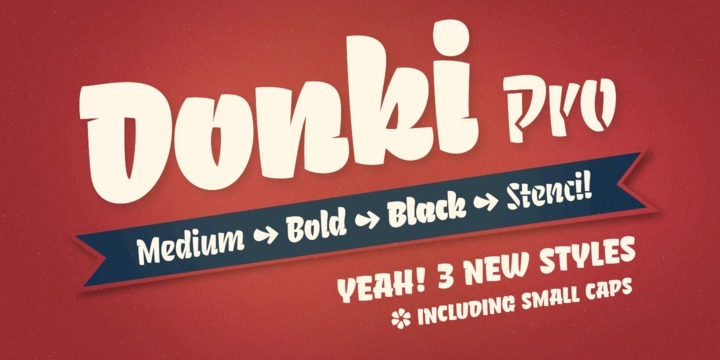 Donki Pro is the new version of Donki created & published by Gunnar Link. It is available in four styles and the fonts include Small Caps. The characters has nice curves and makes it perfectly for display use. Have fun! Glyphs: Any Open Type Features, Basic latin/English letters, West European diacritics, Currency,Ligatures, Small Caps, Central Europe, Baltic, Turkish, Romanian, Open Type Alternates, Dingbats & Symbols. A font description published on Wednesday, June 17th, 2015 in Fonts, Gunnar Link, Gunnar Link by Alexandra that has 2,820 views.